Exploring the world of the Second Temple period (539 BCE–70 CE), in particular the vastly diverse stories, commentaries, and other documents written by Jews during the last three centuries of this period, Malka Z. Simkovich takes us to Jerusalem, Alexandria, and Antioch, to the Jewish sectarians and the Roman-Jewish historian Josephus, to the Cairo genizah, and to the ancient caves that kept the secrets of the Dead Sea Scrolls. As she recounts Jewish history during this vibrant, formative era, Simkovich analyzes some of the period’s most important works for both familiar and possible meanings. This volume interweaves past and present in four parts. Part 1 tells modern stories of discovery of Second Temple literature. Part 2 describes the Jewish communities that flourished both in the land of Israel and in the Diaspora. 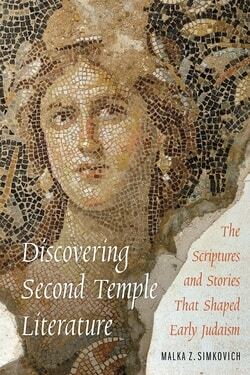 Part 3 explores the lives, worldviews, and significant writings of Second Temple authors. Part 4 examines how authors of the time introduced novel, rewritten, and expanded versions of Bible stories in hopes of imparting messages to the people. Simkovich’s popular style will engage readers in understanding the sometimes surprisingly creative ways Jews at this time chose to practice their religion and interpret its scriptures in light of a cultural setting so unlike that of their Israelite forefathers. Like many modern Jews today, they made an ancient religion meaningful in an ever-changing world.